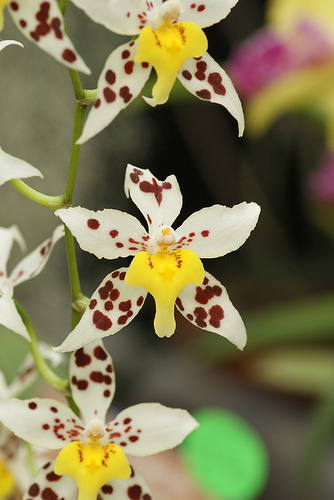 The Odontoglossum orchid genus originates in the neotropics, mostly the Andes mountain range. The higher-altitude species have more flowers, the lower-altitude species have fewer, larger flowers. They have a pair of calluses on the lip, near the column. The flowers of most species are very beautiful. The flower stems emerge from the base of the pseudobulb. Most plants are epiphytes. They like high humidity; many grow in cloud forests. Try for 60% to 80%. They require cool conditions, particularly the high-elevation species. Consider the lower 70's Fahrenheit (21-24C) as a maximum. The temperature should drop 10-15°F at night (6-8C) for best results. Keeping them with Masdevallia orchids works well, as they enjoy similar temperatures and humidity. Watering these orchids plentifully will keep them happy. Don't let them dry out too thoroughly, water just as they approach dryness. They like very clean water, such as rainwater, distilled water, or water purified by a reverse osmosis unit. Fine-grade fir bark makes a good potting mix. They like to be a bit underpotted, so when repotting these orchids, choose a pot that's a bit on the small side, with just enough room for one or two new growths around the edge. Since they get watered a lot, the potting medium tends to break down quickly, requiring repotting every year or two. Intermediate to bright light works well, 2000-5000 footcandles, similar to Cattleya orchids or a bit less.